Fashion Maven... Mommy: More Allure news! Today was MAH-JOR! I mean, the kinda stuff dreams are made of! I have to say that i have been been incredibly blessed throughout this short journey of mine! I started blogging at the end of last year, knowing in my heart I'd be a success. The reason i knew this is because i truly believe when you follow your heart and do what you love, everything just falls into place. Also, success can be interpreted in many different ways. For me, success is finding your passion and pursuing it. I've found mine and can honestly say that i feel pretty complete right now simply because i have a place to write my thoughts about my favorite things! Two and half months in, i got a major nod from the Bible of the beauty industry Allure magazine when they selected my blog as an alternate for their Beauty Blogger of the Year awards. This still surprises me because at that point, my blog was so small. I had only a hand full of followers yet Allure found something special about it. I have since sprinkled it with so much more wonderful information and along the way, I've gained over a hundred followers. I value each and every page view, comment, etc . Well, while I'm still at the beginning of this wonderful journey of mine, another opportunity has come my way. I recently signed up to be an Allure Enthusiast, which consists mainly of a panel of readers who provide feedback on certain beauty products as well as other information Allure may need. Last Wednesday night, i received an email from Allure asking me to fill out a questionnaire to this three part selection process for some major fun stuff. Basically, i filled out this fun questionnaire and submitted a picture of myself as requested. If they liked what i submitted, i would hear from them by last Friday. Well, i did! This lead me to the second portion of the selection process which was a phone interview. Jennifer Friedman contacted me and mentioned how she was glad that i was already on Allure.com's blog roll which is a pretty cool thing in itself. I was asked about my favorite beauty product as well as how i shop for beauty products. I loved answering these questions! I can talk 'beauty' for hours!!! They sounded pleased with my responses and advanced me to the final selection process consisting of a 'meet and greet' at the Conde Naste building in NYC (Allure headquarters). Um YEAH! OMG the thought of riding the same elevator of Anna Wintour (Editor-in-Chief of Vogue) or Linda Wells (Editor and Chief of Allure) whom BTW i watched on the Today Show just this morning and was filled with a ton of wonderful beauty information... i just about died at the thought! Though there was very short notice, i managed to sneak a little time away to shop for a cute new outfit (first impressions are EVERYTHING)! I made the drive to beautiful NYC bringing back so many memories of a time when I'd worked just two short blocks away from the famous building i was about to enter. 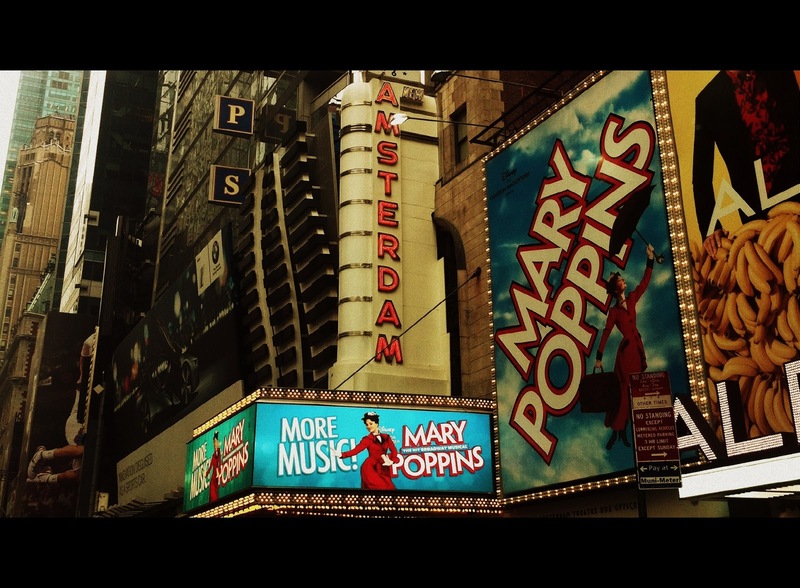 As i entered the lobby, i took a deep breath and thought, 'i'm going to be myself', that's all i can be at this point. The rest is up to the Universe! I mean, the Universe has lead me here so far and quite frankly, it's a wonderful place to be in such a short amount of time. I walked up to the security counter where they found my name on a list in order to be allowed to the elevators. I proceeded to the fourth floor. 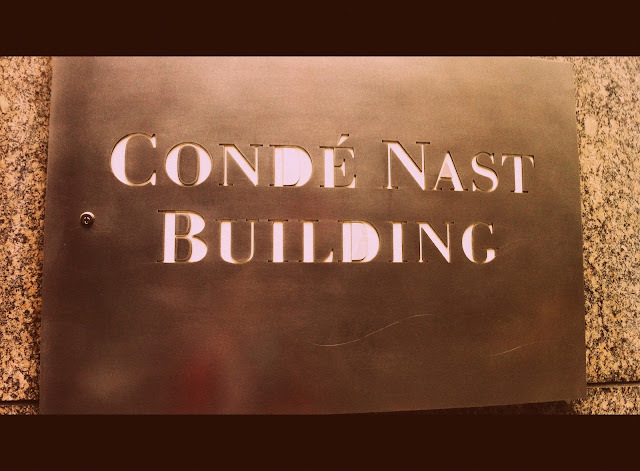 I walked past the famous Conde Naste cafeteria which I'd lunched in many years prior (it's by invitation only). This too brought back wonderful memories! I marveled at the beauty in this building and the people in it. Wow, it was just fantastic! 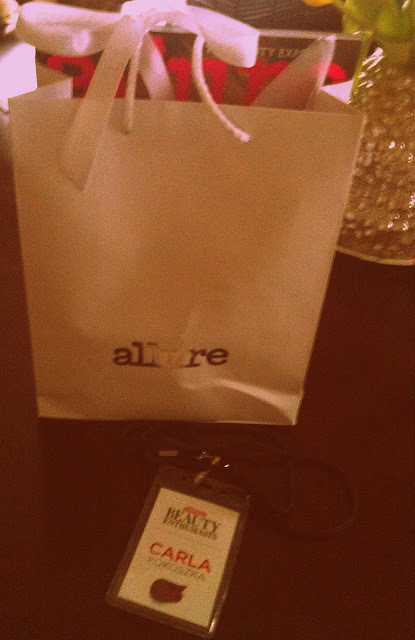 I was quickly greeted by a warm and inviting Allure staffer who gave me a lanyard with my name on it. She asked me if i was the Allure Blogger alternate to which i replied 'yes!' She said she'd heard i was coming which was reassuring! Once the rest of the people selected arrived (there were maybe 10-12 of us), we were escorted to a gorgeous conference room. They provided beautifully prepared refreshments and snacks in a way only the Conde Naste staff would. There were large rectangular tables set up in a square. The Allure staff were seated in one section facing all of us. There was Jennifer Friedman (the lovely person who interviewed me over the phone), whom was conducting the 'meet and greet' as well as a few other people whom consisted of marketing researchers and Allure Staff members. We began by discussing a little about ourselves as well as our favorite beauty products. It was interesting to hear every one's favorites and compare notes. I noticed Jennifer had a couple of pages containing each of our pictures. She carefully took notes about each of us next to our picture. I noticed she wrote a decent amount next to mine... hoping that's a good thing lol. I was surprisingly relaxed and felt in my element. I wanted this day to last forever! I tried so hard to capture every single detail of every single moment that i was in that building. We were told that there are many opportunities ahead. Allure is looking for a few women to be spokespersons at major events, as well as possibly appear in Ad's and be guest bloggers, etc. We will soon find out who will end up fulfilling these wonderful opportunities. Overall, I'm pleased with my performance. I also questioned if there were still plans to possibly work with any of the challenged i completed in the Beauty Blogger of the Year awards. They were very good and if they're not being used with Allure, I'd certainly love to share them with all of you. I was told there was still a possibility so I'm going to hold off on posting them. Hopefully soon you'll be able see them in one form or another. Overall, i come out of this feeling incredibly blessed and lucky to have had such an amazing opportunity and experience. After all, even if nothing major comes out of this, i can still say that this has been the most incredible ride ever! 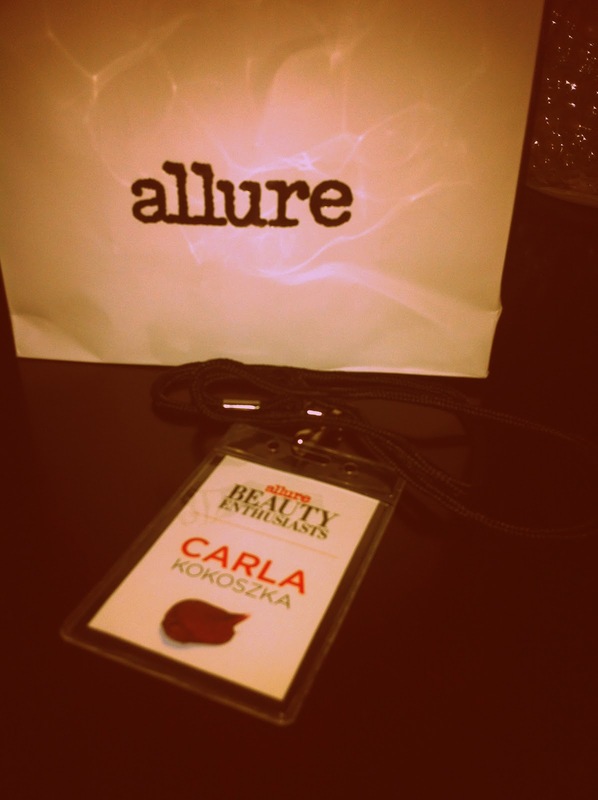 For that, i am beyond grateful to the Allure staff whom until now, has truly believed in me and my little blog! I look forward to seeing where this wonderful journey takes me! Here are a few pictures from today! I apologize in advance for the poor quality of the photos (i typically like using my DSLR) but had to use solely my iPhone to document this event. Here's a picture of me driving into NYC (no worries the car was stopped...hullo, NYC traffic! lol). This is a couple of blocks away from Conde Naste in the middle of Times Square. The picture below kind of speaks for itself! Allure was very generous as always and gifted us with lovely products and the latest issue of Allure. 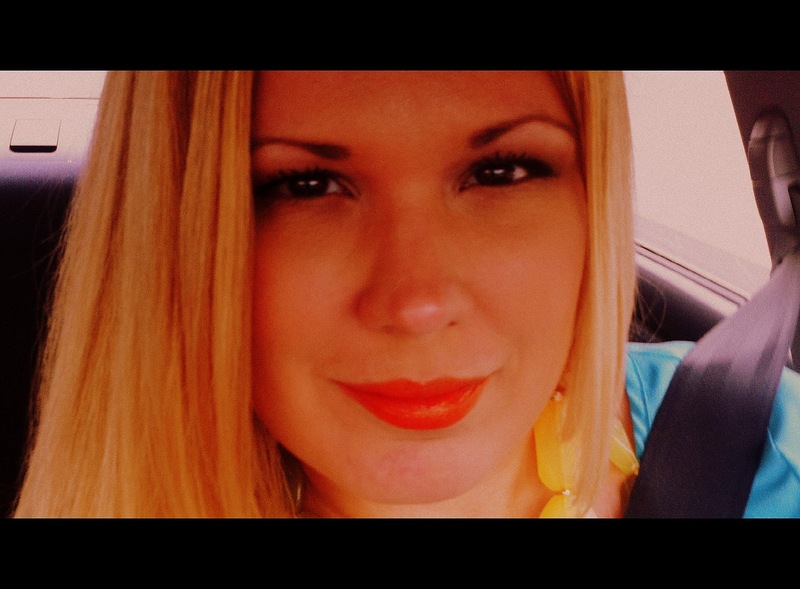 Don't forget to become an official follower of Fashion Maven Mommy. Also follow me on Bloglovin, Twitter @fashionmavenmom and "like" my Facebook page. I was suppose to be at the Meet & Greet today at 12pm but due to an emergency I wasn't able to make it :( I'm glad it was fun, I so wish I could've made it. Dear please Vote for me on fashiolista contest- I'm on final! I'd appreciate it so much! This post filled me with so much determination and hope. I love your view of what success is, and your positive attitude is wonderful! I'm so happy for you! I'm sure something major is on its way because you deserve it!!! Keep us updated!!! I wish I had went :( I would've loved to meet everyone! Ya te sigo! Me sigues? Wow!!! Congratulations!! SO proud of you! Congrats dear and you look pretty here ! Congratulations! Sounds great sweety. Thanks for visiting my blog and you sweet comment! I would love for us to follow each other! (: I am now following you! Lovely photos ! Keep up with the good work ! Following you now - i would be happy if you could follow me back ! Hi! Thanks for your comment! Twin girls!! ;) Ok, let's follow each other. I'm following you now! xoxo! that's so amazing! You look gorgeous!! beautiful pics! !i'm following your blog! !if you like mine,do the same!!! !